We could not have done this without help. Check out the sponsors page. Coverage in "Hamar Arbeiderblad" July 25. Coverage in "Hamar Arbeiderblad" June. Coverage in "Hamar Arbeiderblad" May 14. Coverage in "BUstikka": "Rykkinn-kvinne på kite over Grønland: En annerledes sommerferie"
Coverage in "Hamar Arbeiderblad" July 25: "Saskia E. Boldingh (25) fra Tingnes skriver verdenshistorie. Sammen med to venninner har hunkrysset Grønland fra sør til nord ved hjelp av vindkraften." Coverage in "Helgeland Arbeiderblad" about the expedition July 23. 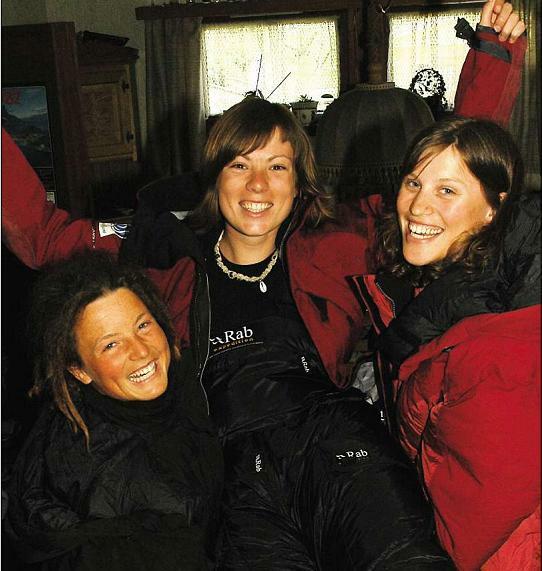 Article about the expedition in "Friluftsliv" ed. 4 2008. 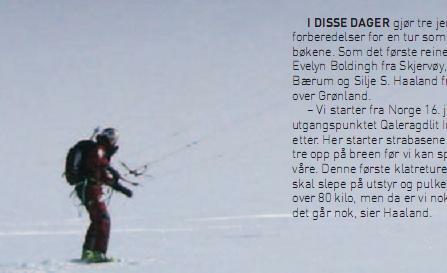 Updated article about the expedition on www.gamme.no July 22 (in Norwegian). Coverage in "Hamar Arbeiderblad" June: "Nå har vi vært borte i en uke, og etter et par dårlige avgjørelser, har vi endelig begynt å kite." Finally our gear is on its way to Narsaq! After a rather chaotic morning Saskia and I left The Boldinghs Inn, heading for Denmark. The plan was to bring all our gear to Aalborg, and ship it to Narsaq in Greenland. This meant pack the car in Saskias hometown Nes on Tuesday, drive to Larvik, onboard the ship (Danskebåten!) and sleep all the way to Hirchals, drive to Aalborg in the morning, drop our cargo (yes it was a lot) at the dock, sign some papers, drive back to Hirchals, take the same boat back and be in Oslo within my plane left at 10 pm the same night. Puh! Because we did not have too much time finishing our packing, we kind of continued this process in the car…We hadn’t had time to eat much breakfast this morning, but thanks to Corie (The Boldingh Inn’s chef, coordinator and administrator –read Saskia’s mother), we had a lunchbox we could live on all the way to Larvik. Knowing we had only 4 hours before or boat left Larvik, there was no time for stopping on the way, no coffee or pee-breaks either. So, while me sitting beside Saskia doing all the lists, trying to figure out what we put where, where we put wrong and what we didn’t put at all…we slowly made our way south. Slowly? Oh yes. Taking the ferry at 7 pm means driving through Oslo at 4:30, and that means slow traffic. 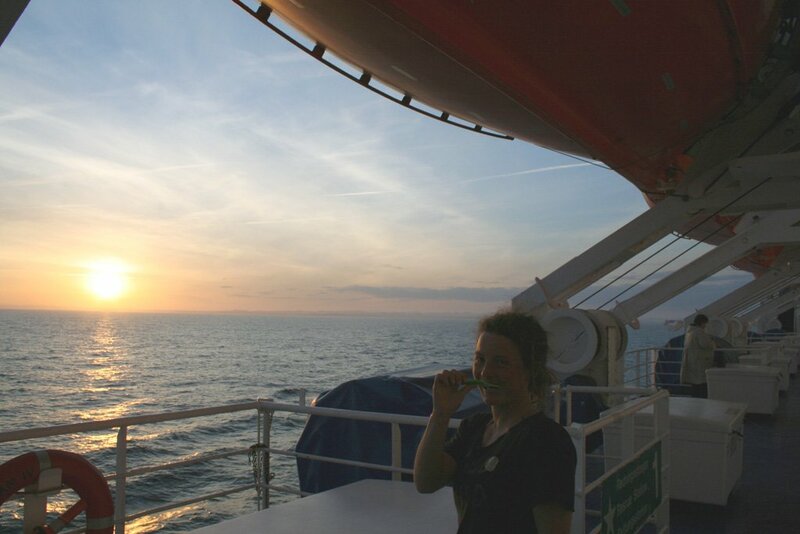 My job as copilot changed from packing and writing lists to finding an alternative route to Denmark. Maybe we could take the ferry from Oslo? Full booked. Driving around Sweden? No sleep, bad suggestion. After calling almost the whole world, agreeing there would be no queue after Drammen, we figured out how big speeding ticket our budget could bear and continued to Larvik. We made it. After a good night sleep our mission was first of all to find the correct harbour in Aalborg. All time we spent driving cut down the amount of time we could spend packing and shipping our gear. We had to be back on the ship in Hirchals within noon. This gave us 4 hours for shipping included driving back and forth. Route finding fortunately turned out to be no problem at all. There were signs to “Grønlandshavnen” (The Greenland harbour) all the way! And so we parked outside out side Royal Arctic Line’s office before 10 am. Saskia went inside to get our papers while I tested our newly repaired stove just outside. What do you mean we should have done this before? Didn’t I say it was newly repaired? Well, it worked! At the “Packing house” we were met by a nice Santa Claus-looking man (except he was a lot skinnier) who couldn’t who quickly guessed we wanted to spend out summer holiday skiing on Greenland. Were we going to Narsaq? Oh, just a sek, my friend here comes from Narsaq. So we got to speak to this guy, and he could tell us there was no snow in Narsaq! May be a little on the ice still, so at last they agreed on shipping our skies. After 30 minutes with closing boxes, going over our lists (again), stuffing oatmeal into open corners of our bags and trying to stack all collies together, Santa Claus came with his truck, lifted all our gear and drove away. We waved goodbye. At first very exited, shouting and talking about how nice it would be for all our clothes and kites to travel over seas. But then, we became silent, both of us. Feeling quite empty we went back to the car. We didn’t even try to figure out what we forgot this time. Kind of the same feeling as when you hand in your papers at the end of your exam. Very relieved but still worried. Putting the harbour behind us, we cheered up on the way back. Although: Danskebåten was waiting for us! End of this story: our gear is on its way, and soon we will come after it! Late in the evening friday 9/6; Ingrid and Silje came to Saskia’s parents house close to Hamar, now better known as “the Boldingh’s Inn”. We where going to spend a nice, warm and sunny Pinse-weekend packing our gear before driving it to Ålborg in Denmark for shipping to Greenland. Silje came from Oslo with the train while Ingrid had been driving the whole afternoon down gudbrandsdalen from Trondheim in her Nissan Bluebird 1985. Saskia had given here the route; take of from the main road, follow the signs to Nes and when you bump into a big church and see the lake you are on the right place…. And of course she drove wrong, but finally after trying out al the small roads at Nes she saw the church and the lake. 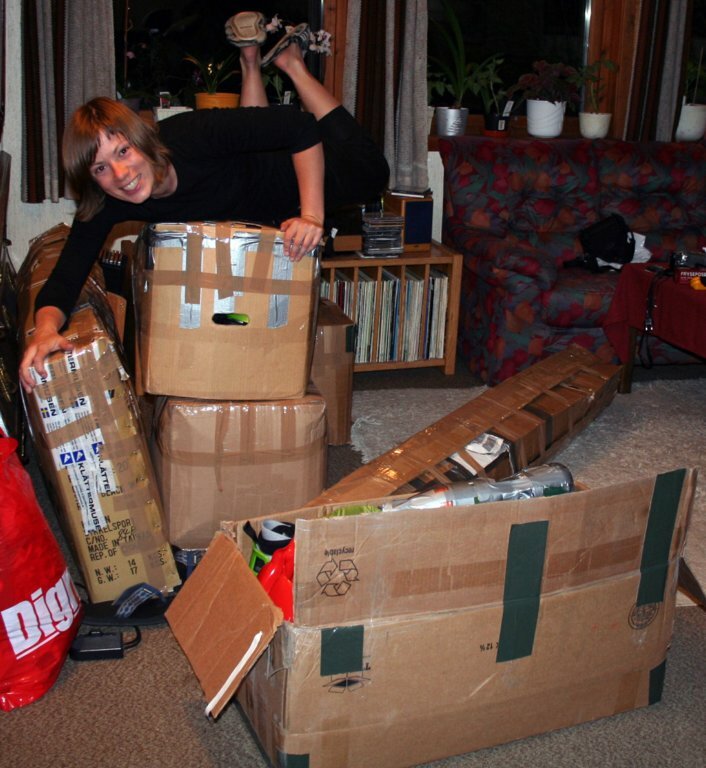 Inside the house there was a total chaos; Saskia’s father had picked up at least 7 boxes with gear that came with the post. I bet the postman has back pain after delivering all those heavy boxes. Saterday morning, where to start…… In the chaos in the living room we tried to figure out what we got, what we were still missing and what we could buy in Hamar. We started our day at the local farmer store, Innkjøpslaget, this is a store where you can get everything from a thermos to a electric saw and chocolate. We bought strips, which became really necessary later this weekend. Then we drove to Furnes and picked up the ski Saskia’s friend Stein Olav had fixed when he actually should have been driving his trekker trying to finish the våronn (he is a farmer). But we are really happy; he did a hell of a job, now we are able to use this extra ski on all of our boots, even on Ingrid’s big shoes…. What to do if we meet a Polar bear on Greenland? Ingrid’s solution; we use our rifle to shoot the bear, if we fail we try to use the signal pen, and if even this is not working….RUN! So we bought the projectiles and the signal pen’s. Just 8 projectiles, (we can use 4 at a time) if we meet a Polar bear more than twice we have really bad luck (and we are fucked…..). Did you know that all shops close at 16 with pinse, we do know now….! After trying to get in to a sport shop that was closed and commenting that the food store was overcrowded, still no bells started lauding. So; we went to the shore and sat down. Relaxed we tried to calculate what we had to eat more than 4000 calories a day. When we where ready to buy our food, we walked to the food store with our big list, but too late, the store was closed….like ALL the other stores! It felt like we where the only persons who did not know. But heads up, we had enough to do. Preparing our kites, fix the pulkas, check the tent and pack our gear, which at the moment was lying in a total chaos all over the living room. Finally, Monday evening we got so far that we could start packing. 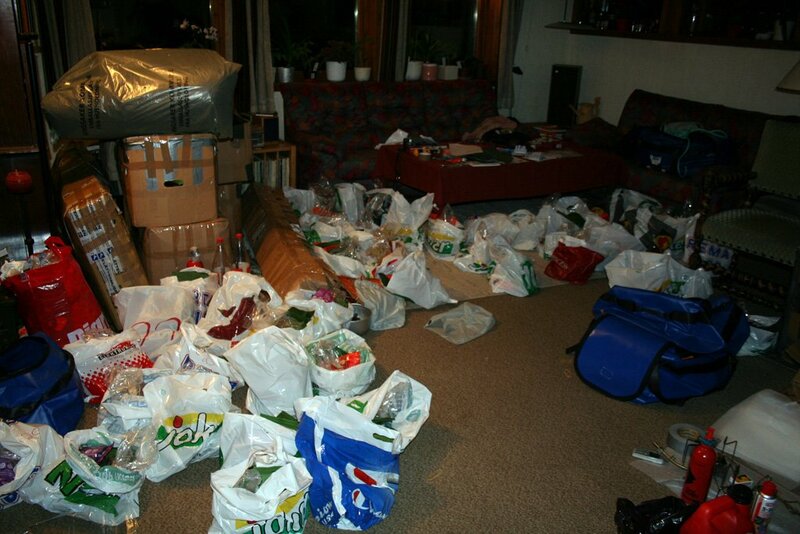 Ingrid tried to make a system; one long packing list, some space in the living room and each one corner of the living room with a similar number of stuff sacs. Three pair of socks, 3 boxers, 1 buff, 1 shee wee etc. And the most important thing; all these things had to be putted in the right stuff sac. After finishing the to pages long list Ingrid had to drive back to Trondheim to get to here work in time. Silje and Saskia used the rest of the evening putting everything in boxes so that our gear would come to Greenland without scratches. We finished at 3 o’clock in the morning. Tuesday morning 6.30am in the car; Silje and Saskia where sitting in the car on their way to Brumunddal eating dry-tech porridge. 7 am, the food store; They are walking in to the food store buying a lot of chocolate, raisins, cookies, outs and coco. Did you know that coco have the most calories pr 100gr, even more than chocolate? 9 am, Felleskjøpet; we were buying white gas at the local farmer store, felleskjøpet. 9.30 am, garage; we had to change the appointment for the car, it should have been at the garage today. But since we wanted to drive our gear to Denmark this evening we had to move it. 10 am; buying the last things before driving back to the Boldingh’s inn. 10.45 am; we arrived at Nes. A bit stressed we started making the breakfasts for the whole trips, putting the chocolates and the cookies in the food bags (one for each day) and calling the last phone calls. 14 am; we putted everything in the car and drove in the direction of Oslo. We were much relived that we got on the road before it was to late but at the same time we where praying that we did not forget anything. Denmark, here we come!!!! Fredag 4.april hadde Rana Blad ein reportasje om ekspedisjonen vår. Fredag kveld 7 April bad Ingrid og Saskia toget stoppe på Drevvatn stasjon. Silje var allerede der og et komplett ”jenterikuling” samlet seg på Haaland-gården i Drevvatn hvor Silje er vokst opp. Mor og far Haaland lovet kost og losji samt fri benyttelse av verkstedet, skytebane(les åker+skogen bak fjøset) samt bil hele helgen og skyss til Svartisen! Dette skulle bli en kjempehelg og ALT skulle fikses, mekkes og ordnes. Silje og mor tjuvstartet på fredag med å hente ut pakker på posten. Ski, støvler, staver, liner til kiter, gpser, puh, det ble full bil fra byen og hjem! Lørdag formiddag dro vi til Rana Spesialsport hos Egil. Her ble vi fra tidlig morgen til langt over stengetid og gikk oss nesten vill i kjelleren, prylkåt?neida… Hjem kom vi med pulker, tau, strikk, kroker, en drøss med klær, hjelm, briller og en haug med ideer! Mekkemekke…. Det ble kappet, borret, tredd, sydd, kranglet og skranglet. Pulkdrag ble en utfordring. Etter et par timer endte vi opp med to typer. Saskia og Silje kjørte på en lånt ide fra Vindkraftekspedisjonen og var sikker på at dette var ”bankers”. Det skulle selvsagt vise seg at Ingrids hode ikke er med for ingen ting. ”The brain” hadde sin egen kreasjon på strikkavlastning i draget og etter prøveturen hadde den lett knust alle andre forslag! Som sagt; mye skulle fikses. Vi kan kalle det en slags utdanning i ”Handyman-yrke”. 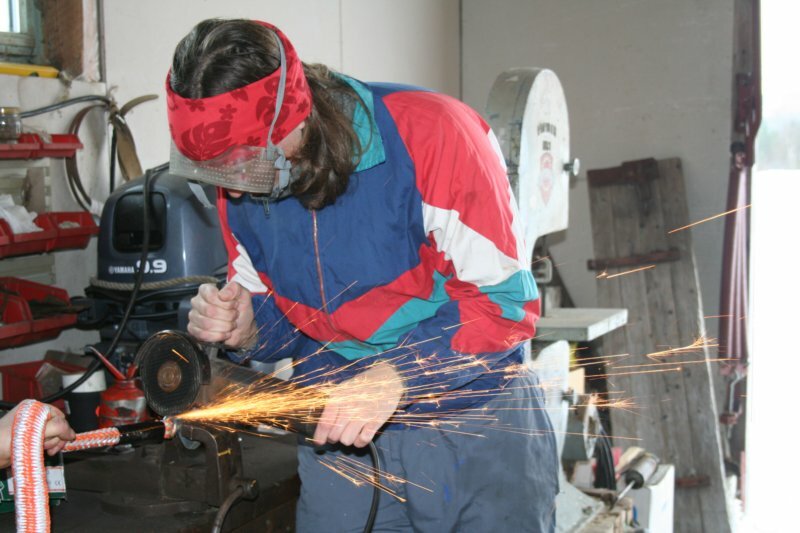 Kappe metallkorker med vinkelsliper, borre hull i pulker, spleise rundspleis med fire innstikk, sy fire lag strikk uten å knekke nålen, det løste seg til slutt! Far viste og lærte og nå føler vi oss som riktig handy-jenter alle som en! Ny utfordring: Treffe en isbjørn på 70 meters hold…Søndag skulle det skytes! Far skaffet ammunisjon og vi satte opp blink i skogen. Stakkars bjørketrær…For å si det sånn; det var godt vi skjønte at dette krevde litt trening! Høyre skulder fikk gjennomgå, men det var verdt det. Et blåmerke rikere, men vi tror (håper?) vi skal klare å treffe bamsen om den skulle dukke opp. Våknet i dag på Vassendsætra. I går kitet vi over Gjevilvatnet, i dag skulle vi tilbake, veldig rundt regna 1,5 mil. Titter ut, været er perfekt... for en fjellvandrer: lett skydekke og vindstille. Ah, skal bli gøy å krysse det vannet med telemarkski og plastsko. Men værmelding var med oss, det skulle blåse opp. Så vi drakk kaffe og la kabal. Rundt tolv trasket vi ned på vannet, lite vind, så vi startet med å gå. Etterhvert slo værmeldingen til og vi la ut 11'ern og 9'ern. Men vinden bare økte, så vi byttet kjapt ut 11'ern med 6'ern. Vi fikk de i lufta, men fant rimelig fort ut at vi skulle snørekjøre begge etter 6'ern. Mens vi pakket sammen 9'ern skjønte vi at værmelding underdrev sterkt, og at her var det bare å kaste inn håndkle, eller mer passende pakke seilene. Dermed gikk 6'ern også neddi sekken sin. Med den sterkt økende vinden så igjen mørkt på å krysse vannet. Men aha, hva har man vel med seg jervin duk for, den skal jo brukes i vinden. Vi holdt opp duken mellom oss og kom oss over mesteparten av vannet på 50 min! Den siste kilometeren klarte vi å traske. Så kanskje en slik en i tillegg til seil, hahaha. 01.01.08 dro tre jenter fra nyttårs-sus og rus opp til snaufjellet. På Finse ramlet vi av toget med telt, ski, kiter, skiseil, mat og alt som skal til for en uke på fjellet. Ved siden av oss på stasjonen sto en så og si identisk ekvipasje; kiter, store sekker, pulk og mye stæsj. Niklas, Trygve og Kalle, som utgjorde "Vindkraftekspedisjonen 2005" kom opp med samme tog og inviterte til grandiosa-fest på kvelden. Hurra-hei og hopp for oss som kunne spørre om alt vi lurte på (på det daverende tidspunkt, nå har vi minst like mange nye spørsmål?) siden disse gutta var de første til å seile fra sør til nord på Grønland. 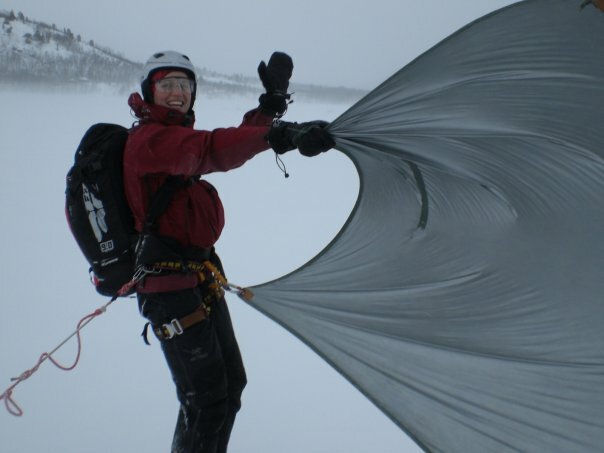 Så var det klart for kiting; Vi hadde med oss to nye kiter hver fra Ozone. En 6`er og en 9`er. Med disse fikk vi en bokstavelig talt "flying start". Det blåste 15-20 m/s og vi hang og slang over store deler av Finsevann! Ingrid hadde til da kun kitet på vann. Den sterke vinden gav litt av en start på snø! Men siden Ingrid er en meget habil telemarkkjører var det stort sett bare å få foilkiten opp i luften og legge seg på stålkantene: Ingrid forsvant inn i snøkovet og alle klappet i hendene. Dagen etter økte vinden. Vi valgte å bytte ut kiter til fordel for skiseil. Nå var det på tide å dra på tur. Vår Første Prøvetur! Med sørøstlig vind siktet vi oss inn på Hallingskeid. 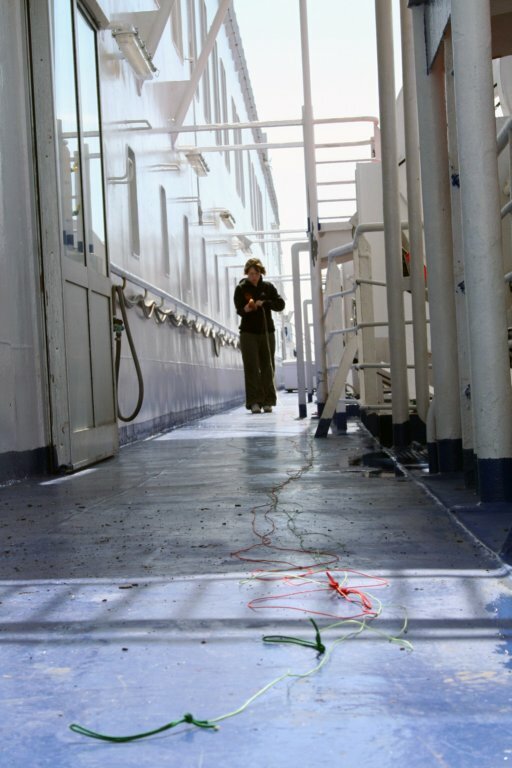 Med sekk på ryggen, og kompasset godt surret rundt håndleddet seilte vi i total "whiteout" mot Hallingskeid. Det blåste mer og mer. Vi oppdaget fort at vi ikke engang trengte å ta opp seilene. De lå stort sett og blafret foran oss nede på bakken, men av gårde gikk det! Ca halvveis kom vi til Grotrust, en vokterbolig langs bergensbanen. Vedskjulet var ikke låst og vi snek oss inn for å få litt le for vinden og drikke en kopp varmt vann. Ut i det hvite igjen blåste vi videre vestover. Sikten var blitt atskillig bedre og vi slapp å være redde for å miste hverandre. Men så, etter å ha latt seilene ligge og blafre foran oss hele dagen for ikke å rase av gårde, begynte det å gå saktere. Vinden løyet helt og plutselig sto vi midt ute på et vann og måtte traske av gårde med seilene rullet sammen under armen. Litt av en kontrast! Vi rundet en kolle og det trakk så vidt i luften. Etter å ha passert enda en haug, traskende, kunne vi rulle ut seilene og dra nytte av vinden. Vi blåste igjen av gårde og kom til slutt til Hallingskeid. 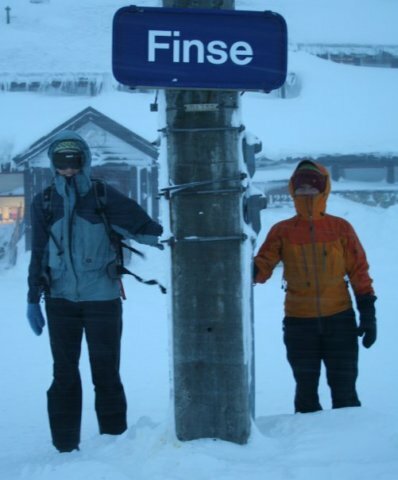 Vi satte oss på stasjonen og spiste den frosne matpakken mens vi ventet på toget som skulle bringe oss hjem til Finse. "Jenter i kuling", passende navn. "Jenter i stiv kuling med storm i kastene" hadde om mulig passet enda bedre for den første turen. En bra prøvelse på hva hardt vær vil si! Det var godt å kunne sette seg inn og slippe å anstrenge seg for å holde balansen. Ly for vinden blir det verre med på grønland?